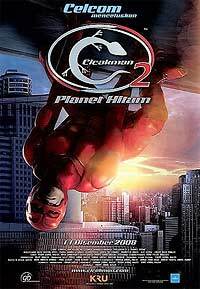 Cicak-Man 2: Planet Hitam (2008) - Sci-fi-central.com. Malaysia  2008   Directed by: Yusry Abd Halim.  Starring: Saiful Apek, Fasha Sandha, Aznil Hj Nawawi, Tamara Blezinski, Adlin Aman Ramlee, Mizal Zaini, Sharifah Amani, Louisa Chong, Linda Onn, Yusry Abd Halim, Fahrin Ahmad, Azwan Ali, Julie Dahlan.  Music by: Yudi Ashady. The evil Professor Klon is back, not only to overthrow the Government but also to control the world's supply of fresh water through his ingenious plan, ''Black Water''. When our blue planet has only 72 hours before turning black, Cicakman comes to the rescue. But he is not only faced by Professor Klon's artistic hired assassin ''Rrama'', but also his old enemies, Ginger Boys, who have returned in a powerful spiritual form. As the situation starts taking a downward spiral, even a super hero needs help. And much to his surprise, help appears in the most unexpected forms, including Danny his demised best friend, a powerful feng shui master and an unlikely party. Apart from his heavy responsibilities to save the world, he is compelled to address and resolve his own personal dilemmas... ''Hairi'' vs. ''Cicakman'' ... his personal feelings towards Tania, who is seeking the true identity of Cicakman... and ultimately... to choose whether to sacrifice his own life to save Iman (Danny's blind sister).